Do you like opera? Too bad! Realms of Ancient War has got itself a release date! 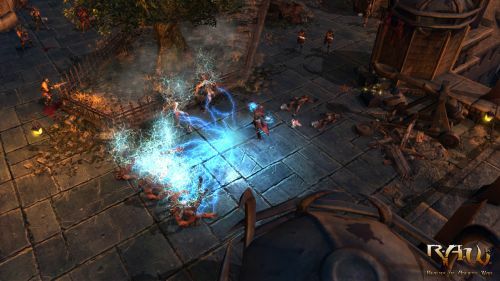 The action RPG features two player local co-op and your standard Warrior, Wizard, and Rogue classes. On paper it sounds kind of vanilla, but is looks pretty good in motion. Check out the trailer after the break. It features cooperative gameplay footage, huge area of effect spells, and some banging opera. I love damage indicators! Looks like a fun, fast-paced Diablo clone for couch co-op-ers. When is this title coming out? I hope it doesn't get lost in the fall crush... What's that? Really? Oh, ok. Realms of Ancient War actually has three release dates. It hits the XBLA on September 19th. Ouch. I'm not saying that's bad timing, but another co-op title comes out a day earlier and it may just over shadow it. Hell, Torchlight 2 comes out on the 20th. R.A.W. hits the PSN on September 25th, and then PC on October 4th. Maybe we'll be done pillaging Pandora by then.